The Women of InfoComm Network (WIN) rose early this morning to share caffeine and the finer points of intergenerational networking. 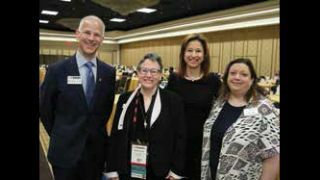 After a brief opening address from Betsy Jaffe, SVP of member services at InfoComm, and a heartfelt welcome from Penny Sitler, chair of the WIN council, the stage was turned over to keynote speaker Julie Silard Kantor. Founder and CEO of Twomentor, Kantor is an advocate of networking and cooperation between established professionals and young women attempting to break into STEM careers. She cited the unconscious biases and discouraging social environments as some of the greatest social obstacles to girls and young women interested in technical professions. Kantor cited these obstacles as primary contributors to the dearth of women in STEM fields. However, she favored an inclusionary approach to this problem, noting that gender balance in the workplace relied on both male and female mentors and mentees. Adding a financial punch to her message, Kantor also discussed the direct cost to a business of losing employees from their work force. She estimated that the cost of losing a single employee costs a business approximately one year of that employee’s salary, had they stayed. Citing Gallup polls of Millennial’s expectations and desires of a workplace, Kantor promoted mentorship practices as a key tool in retaining a generation of employees known for its willingness to look for work elsewhere. Wrapping up the breakfast, the audience was asked to stand and practice the concepts discussed by seeking out others in the room and pursuing correspondence that might one day lead to a strong mentor relationship.